Top off your heavy duty flagpole with a LED light that keeps Old Glory proudly illuminated. The solar-powered light fits on the Titan Telescoping Flagpole and shines from dusk until dawn to ensure the flag is properly lit. Easy to install but I don't feel the solar light puts off enough light. 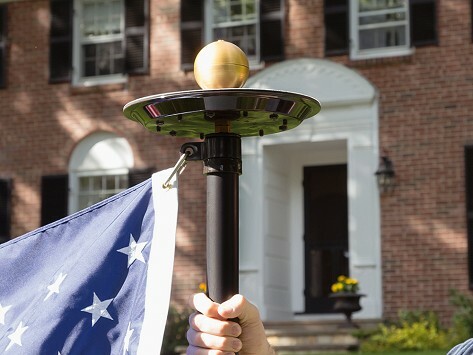 The folks at Flagpole Farm want to make it easier for you to display a flag in your yard, so their heavy duty flagpoles do the job with a more accessible design. The Titan Telescoping Flagpole consists of an aircraft-grade aluminum pole that fits into a base cemented in place. The pole extends section by section and locks into place, thanks to a secure interlocking sleeve design. It’s strong enough to withstand winds up to 75 miles per hour, but—this is the best part—you can just take the pole down in bad weather as an extra safety measure. Another great feature is that, unlike traditional flagpoles, this one doesn’t need a rope or pulley to display the flag. The flag clips on to swivel rings and flies freely without any knots or tangles. Add a solar LED light built just for this pole and your flag will be properly lit from dusk until dawn. The low-maintenance flagpoles are made in Idaho where Ric Eborall heads things up at Flagpole Farm. The team there is committed to making it possible for more people to proudly display a flag in a smarter, and easier, way.